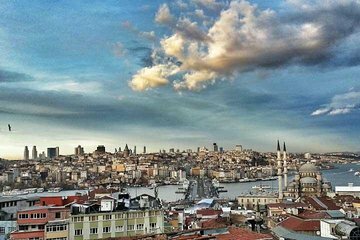 Utforska Beyoglu-området i Istanbul på en kulinarisk vandringstur som ger en titt på staden genom sina mat- och kulturattraktioner. Från Taksim Square, gå mot Gyllene Hornet, passera Gezi Park och stanna på lokala platser för att prova kulinariska läckerheter. We were very happy with all aspects of our tour with Experta, especially with our tour guide, Erkan. We told him we had seen a few Istanbul highlights the day before and he quickly and effortlessly altered our day with him to include sights we had not yet seen. He pointed out the various churches around the area and provided much insight into the religious and social aspects of the city. The restaurant where we had lunch called Ciya and located on the Asian side was fantastic and very different from the meals we had in Istanbul prior to this one. We had to be back near the Galata Tower at a certain time and Erkan went all the way back with us and made sure we got to where we were supposed to be. A very kind and special thing to do. All in all a very lovely day!